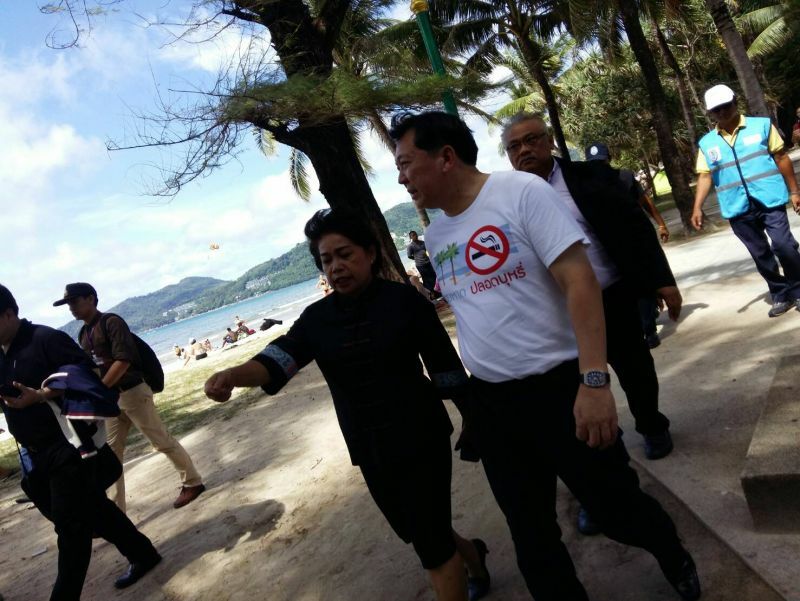 PHUKET: The Director-General of the Department of Marine and Coastal Resources (DMCR) yesterday (Nov 13) inspected Patong Beach following the launch of their cigarette ban on Nov 1. 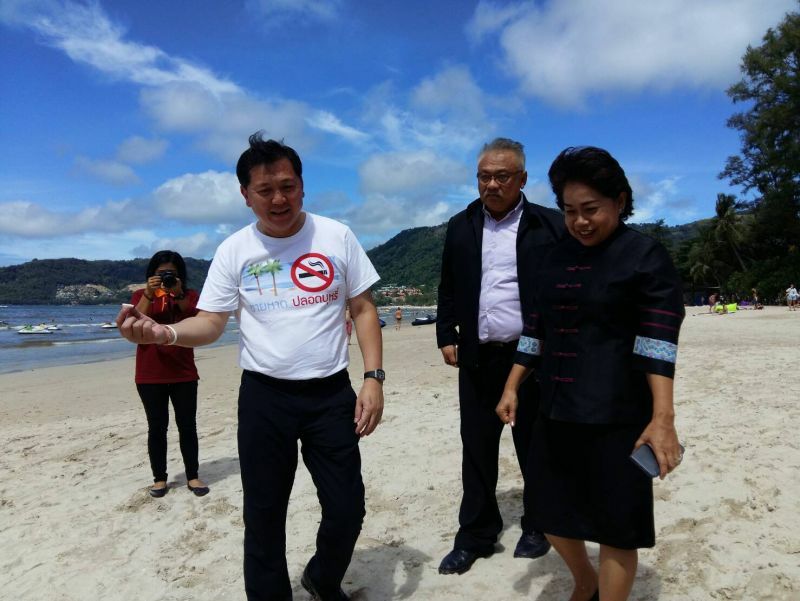 DMCR Director-General Jatuporn Buruspat along with Patong Mayor Chalermluck Kebsup inspected Patong Beach at 1:30pm. Mr Jatuporn said, “During our inspection we found many tourists smoking within the designated smoking areas provided by Patong Municipality. There were also no cigarette butts found on the beach. Patong Municipality has done a very good job on this campaign." “The campaign was launched at 24 beaches around the country after the DMCR and the Department of Environment Quality Promotion (DEQP) signed a Memorandum of Understanding (MoU) to confirm their stance on supporting the ramped up penalties available to enforce the smoking ban and the move to prevent litter on the beaches,” Mr Jatuporn explained. “Tourists at all 24 beaches are provided with information about the policy. Most of them agree with the rules. They have also suggested that every beach be included in the campaign. I think that in the future, the Ministry of Public Health’s Department of Disease Control will issue this rule for all public areas, and beaches might be included as public areas,” Mr Jatuporn said. “The no smoking ban on beaches is good for environmental tourism. The most important thing is the sea water and that marine life is not affected. TRUE and the AIS mobile networks have cooperated with us by providing warnings in Thai and English via SMS before people enter the beaches. This innovation is part of the Thailand 4.0,” Mr Jatuporn added. “Some local authorities around the country that have not been involved in this campaign have also issued municipal laws for their own no smoking areas. They have already charged people as far as I know. “If our campaign is successful after the law is enforced fully after February 2018, the law might be enforced all over the country,” Mr Jatuporn concluded. 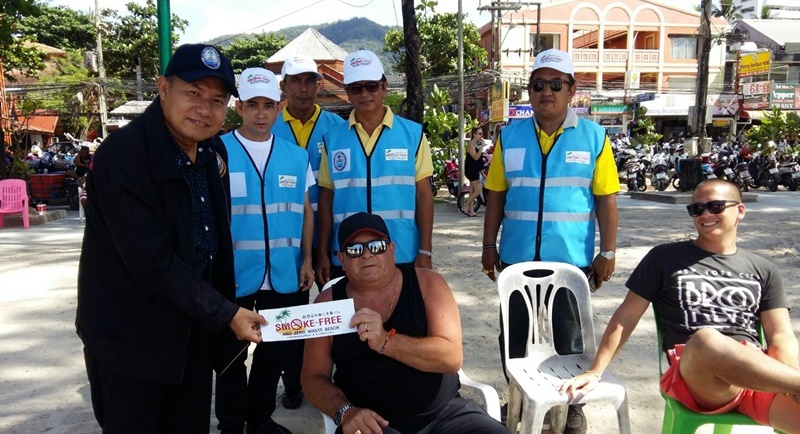 Patong Mayor Chalermluck said, “More designated smoking zones might be added to the 26 already set out along the three kilometre Patong Beach should they be needed. If people want more zones we will add them so we can get rid of cigarette butts on beaches. All so authority self satisfaction without contents. Just simple, because, oh oh, when it get more complicated they have to work. And their job is not mend 'to work'. Only talk, order, look, and smile for a photo to justify their existence.